(Please click here to access information on Jane & Louise Wilsons current exhibition "Undead Sun"
c. nichols project presents Imperial Measure, an exhibition of recent work by Jane & Louise Wilson. 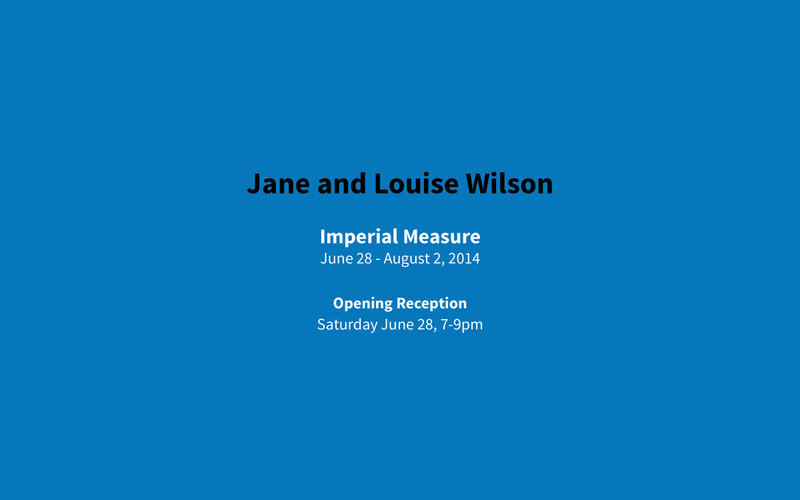 Imperial Measure marks the artists’ first exhibition in the gallery, and their first solo exhibition in Los Angeles. Bringing together a series of intimate collages and bromide prints, Imperial Measure presents the contemporary abandoned interiors of Pripyat, a Ukrainian city built in the 1970s to house Chernobyl factory workers. Pripyat, or Atomgrad as it was previously known, was evacuated in the wake of the 1986 Chernobyl nuclear disaster. They also present a newly commissioned piece documenting the now inoperative San Onofre Nuclear Generating Station of Southern California, or S.O.N.G.S. Measured, monitored and documented extensively over the past 25 years, Pripyat has maintained a human presence in the form of researchers or day-trippers creating an intersection of catastrophe and desire. From kindergarten to cinema, the recurrent, intrusive motif of a yardstick is placed in each photograph to highlight Pripyat and San Onofre as strange places of fascination. Despite their radioactivity and failure, this fascination manifests in what the artists call 'dark tourism'. Sculptures titled Blind Landing, 2012 are cast in aluminum and painted black with white marks. Reminiscent of an apparatus originally used by the film industry in the construction of sets, the Wilsons publicly sited these yardsticks in the disused H-bomb test laboratories on Orford Ness, an island off the Suffolk Coast in England. The now decommissioned site once belonged to the United Kingdom’s Ministry of Defense, where it was utilized as the Blind Landings Experimental Unit during the Cold War. Hinting towards the historic relevance of the island as a future ruin, the measures also point to an architecture of forensics and camouflage (as well as the obsolete) because of their imperial standard: the yard (0.9144 of a metre), or 36 inches. Jane and Louise Wilson were born in Newcastle, England. From working together in 1989 and each receiving their MAs at Goldsmiths College of Art, London in 1992, they were nominated for the Turner Prize in 1999. Selected exhibitions include Public Offerings, MoCA Los Angeles, 2001, (group); Unfolding the Aryan Papers, at the Stanley Kubrick retrospective, LACMA, Los Angeles, 2011-12, (group); Ruin Lust, the Tate Britain 2014; Tomorrow was already here, Tamayo Museum, Mexico City, 2012-13; Toxic Camera, screening at the Hammer Museum, Los Angeles, CA, 2013 (artist talk); Tempo Suspenso CAM Gulbenkian, Lisbon, Portugal and Unfolding the Aryan Papers, CGAC Santiago de Compostela, Spain, 2010 (solo); The Toxic Camera, The Whitworth Art Gallery, Manchester 2012 (solo); 303 Gallery, New York, 2013 (solo).